Lexicon Relocation’s partnership with CDK Global impressed the judges for how it freed the HR team to focus on strategic issues linked to talent management – a key goal of global mobility. CDK Global is a world-leading provider of automative IT solutions. Leveraging digital technology, it enables clients to connect with much great precision and efficiency through their websites to customers. As the company has grown, so has its global mobility needs to serve its thousands of clients in over 40 countries around the world. Before the partnership with Lexicon Relocation, which began in 2017, CDK Global (UK) supported its international assignees with an in-house team. However, as the mobile population has increased, so did the complexities of managing assignments and multiple policies. This prompted CDK Global to seek the support of the right specialist relocation management company to help it manage its wide range of home and host country combinations – 16 at present. Lexicon – who won the same Relocate Award in 2016 for its work with the Maritime and Coastguard Agency – listened to CDK to fully understand their needs before forging ahead to research, benchmark and deliver a clear plan to streamline CDK’s multiple programmes into a single core/optional policy agreement tailored to country-specific needs, and that saves the company money. The plan established measurable success factors for the relocation programme and is relieving the administrative burden on the mobility manager, freeing the HR team to deal with more strategic matters. Read about the winners of the other Relocate Awards in the Summer issue of Relocate Magazine. “This core policy allows HR to focus on other key initiatives, like employee retention, relocation initiations and improving the global mobility programme, instead of spending valuable time managing and implementing different programmes,” said Helen Grierson-Shea, director of client services at Lexicon Relocation. Beyond cost savings, for example by moving regional billing to capitalise on local financial conditions, CDK Global is finding the new outsourced partnership has additional benefits. Policy compliance has improved with the introduction of the single policy and, critically for the wider strategic picture, talent management is supported with impressive approval ratings from people on assignment. Lexicon Relocation, as a global mobility specialist, is leveraging its resources, experiences and technology to deliver excellence, and through a single point of co-ordination (SPOC) model. Every CDK employee on assignment is paired with a global relocation consultant, who is responsible for managing their end-to-end relocation, from initial needs assessment to settlement and everything in-between. This personal approach is backed by Lexicon’s supply-chain partnerships and 15 offices globally, which serve client programmes in all time zones across more than 180 countries. It also means CDK’s assignees are able to contact Lexicon Relocation at any time of the day or night, creating an all-round more satisfactory experience. Together, this combination of expertise, efficiency, technological prowess and support in practice translates to an overall average score of 4.3 out of a maximum of 5 for assignee satisfaction, equating to ‘excellent’ and ‘superior’ service, respectively. This is a valuable testament to the strength and success of the relationship, which is just into its second year. Such successful partnerships are built on more than technical know-how and spotting opportunities for policy, systems and process improvements. Truly understanding the client, its culture and ways of working are also critical, as is building trust from the get-go, which Lexicon Relocation delivered by listening to what CDK Global aspired to and needed for their programme of moves. With both Lexicon Relocation and CDK Global prizing innovation, collaboration and partnership to help their clients’ businesses work better, the companies in many ways are similarly aligned. To support these synergies, Lexicon Relocation trains all of its employees to help them understand their clients’ unique cultures and ensures global consistency is maintained through ongoing training around programmes and processes, and bi-monthly webinars. Alicia Cadogan Wilson explained how this approach has impacted positively on her role and the partnership’s success as a whole, “After being a part of an in-house mobility team for three years at another company, the move to CDK, an organisation who outsources their global mobility, was a big change for me. Within my first couple of weeks, I felt comfortable with Lexicon, who helped me to settle in and understand the different policies and procedures. Adding to the policy changes, personal approach and cultural alignment between Lexicon Relocation and CDK Global is the importance of effective IT solutions. Lexicon’s fully customised software, Lexicon360° (L360) has made CDK’s once manual processes more efficient and accurate. Through the web-based platform, CDK can access information at any time over an internet connection and integrate L360 with its HRIS and other reporting systems. Programme performance, activity, management reports, employee records, documents and advisory resources are available to CDK at the click of a mouse. This is further enabling CDK to transform and maximise its mobility programmes in line with its vision and goals. 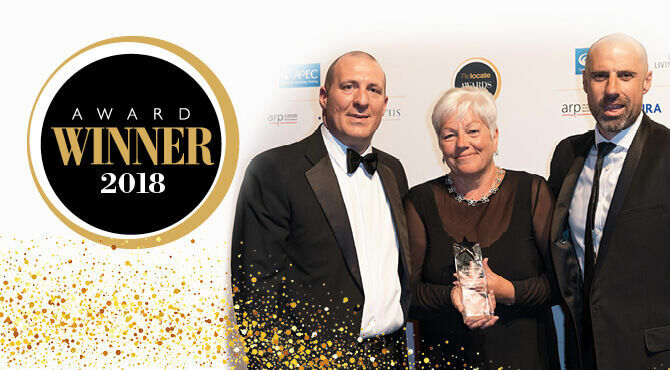 Ultimately, this outstanding Relocate Award-winning partnership exemplifies the benefits to global mobility, employees and the business of finding the right mobility supplier. Through their partnership approach, Lexicon Relocation and CDK Global have worked together to “streamline the global mobility programme, reduce its complexity and enable HR professionals to focus on the resourcing aspects, such as relocation initiation and retention,” commented the judges. Relocate’s new Global Mobility Toolkit provides free information, practical advice and support for HR, global mobility managers and global teams operating overseas. ©2018. This article first appeared in the Summer 2018 edition of Relocate magazine, published by Profile Locations, Spray Hill, Hastings Road, Lamberhurst, Kent TN3 8JB. All rights reserved. This publication (or any part thereof) may not be reproduced in any form without the prior written permission of Profile Locations. Profile Locations accepts no liability for the accuracy of the contents or any opinions expressed herein.